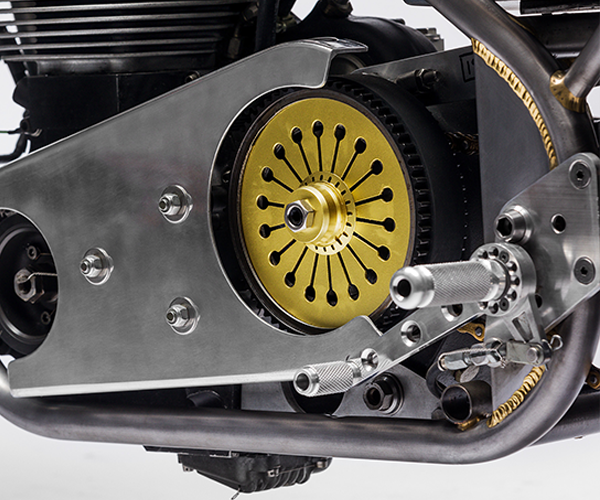 The Café Racer movement has roots as deep as the motorcycle industry. Manufacturers were catering to speed-mad riders as early as 1914, when Norton introduced their ‘Brooklands Road Special’, in a blatant appeal to Edwardian hooligans! The impulse to build a ‘racer on the road’ was also the inspiration for the Cut-Down and Bob-Job in the USA, but the morphology of these distinct species evolved differently in different environments. In America, racing (and riding) was almost exclusively on dirt before the 1950s, while in Britain and Europe, roads and racetracks were paved by the 1910s. The Café Racer as a mature custom style emerged in the 1950s, as riders imitated their Grand Prix heroes by modifying their roadster to look like racers; stripped-down and highly tuned. 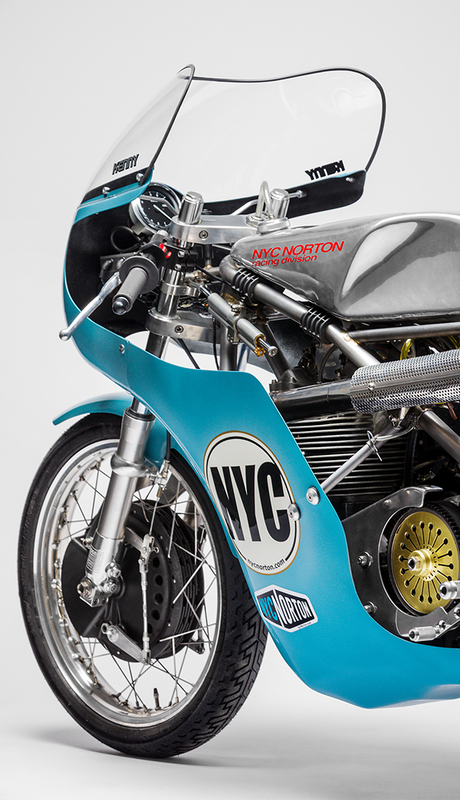 The NYC Norton shop, under the direction of Kenny Cummings, celebrates the apex style of the classic Café Racer custom. The special Seeley racing frames of Cummings’ most spectacular builds are the continuation of Colin Seeley’s 1960s design built by Roger Titchmarsh, and originally intended for road racing. The Café Racer crowd lusted after these gorgeously designed and constructed frames as the ultimate lightweight chassis for a hot road bike. Kenny Cummings restored street bikes, especially Nortons, as a part-time sideline to making music and his day job in publishing. 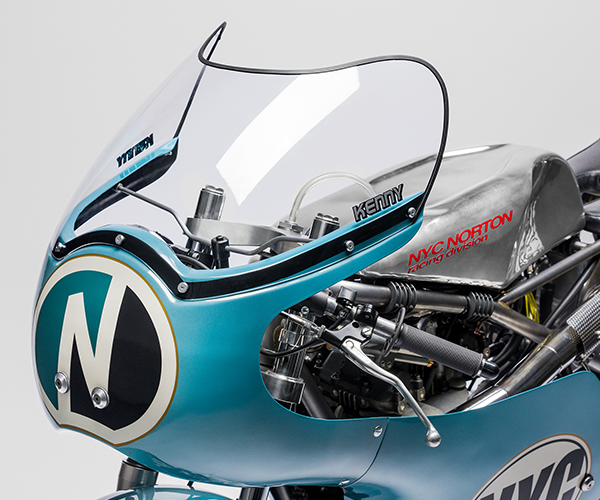 After badly crashing his Norton Commando on the street, he turned to road racing, with a Commando engine in a Norton Featherbed frame. 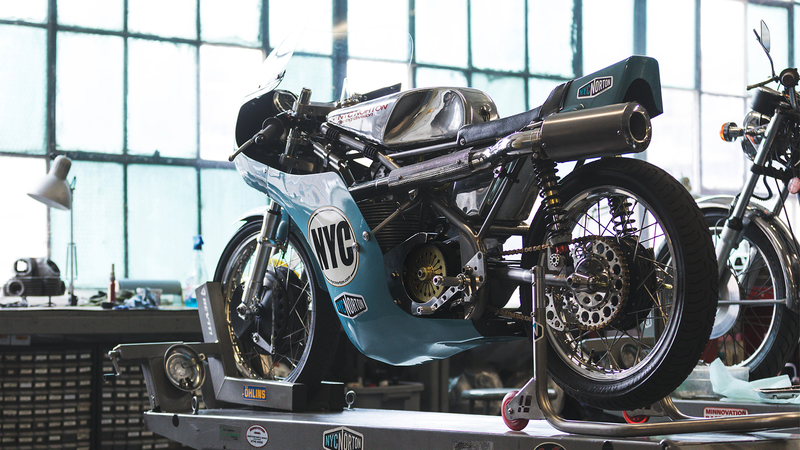 As his skills improved, and he cracked his over-stressed vintage frame, he built his Norton motor into a Seeley frame, and promptly won the AHRMA 750 national racing championship, and repeated the trick 4 years in a row (2007-10).